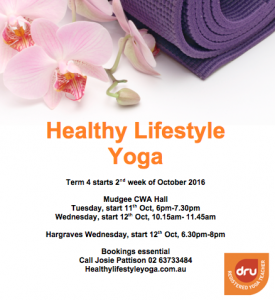 Our knew term of yoga is starting on the 2nd week of october. I am looking forward to another term of Dru yoga with you all. Term 4 will be a 9 week term so the cost is $117. Dru yoga if a wonderful style of yoga which is suitable for people of all levels of health and fitness.